For the first time in British Blues History, a band member, other than the leader, was named in the title of an album. But this Beano-reading Blueso was no average Joe - he was also The Supreme Being. With the Yardbirds, Eric had been playing a Fender Telecaster, but looking to change his sound to something meatier, he bought a Gibson Les Paul, thereby altering history for ever. Much has been written about which model of Les Paul it was, what was special about the pick-ups, or what make the machine heads were; which amplifier he used, and who made the speakers, and what brand of valves it was fitted with; and even what treble-boost pedal he might have used, in the event that he was actually using one at all, thus sending a million wannabe-a-deity guitarists chasing their own tails, trying to achieve the sound of Godhood. The band had recorded two singles for Andrew Oldham's Immediate label, the rather fine “I'm Your Witchdoctor” and the poppy “On Top Of The World,” with session guitarist Jimmy Page in the producer's chair. Page was happy to accommodate Clapton's uncompromising approach, overriding the engineer's concerns. “I just told him to record it,” Page remembers, “and I'd take full responsibility. The guy couldn't believe that someone was getting that kind of sound out of a guitar on purpose.” Sadly, the first single didn't achieve the success it deserved, the second one was never released, and the band found themselves without a deal again - cue Mike Vernon. At Decca studios, Clapton's insistence on working at full stage volume still presented a challenge for young engineer Gus Dudgeon. “I can remember seeing his face the very first time Clapton plugged into the Marshall stack and turned it up,” Vernon remembers. “You could almost see Gus's eyes meet over the middle of his nose, and it was almost like he was just going to fall over from the sheer power of it all! But he dealt with it in inimitable style, and after an enormous amount of fiddling around, we got a sound that worked.” That sound was going to dominate British Blues, influencing guitarists like Peter Green, Mick Taylor, Jeff Beck, Paul Kossoff, Gary Moore, and Jimmy Page. For the serious Bluesfan's view at the time, here are the somewhat sober sleeve notes from Neil Slaven. “ In John Mayall and Eric Clapton we have the two most dedicated blues musicians in this country. 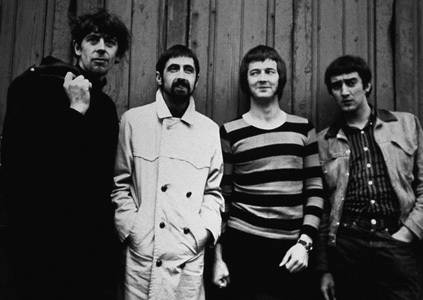 Together with John McVie and Hughie Flint they make up John Mayall and the Bluesbreakers. To hear them play can be a thrilling experience. Playing the blues is such a complex business, involving so many personal and external conditions, that it is never certain how well you are going to play until the first number of the evening is over. Watching the Bluesbreakers perform you are immediately aware of their intense search for new ways in which to interpret their material. In fact it is surprising to learn how little of their music is arranged and how much is improvised. 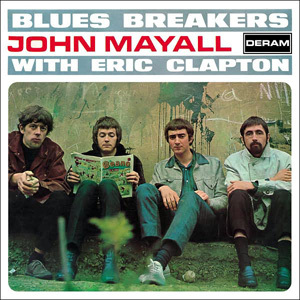 It is because of this phenomenal ability to improvise that John Mayall and the Bluesbreakers are the premier blues group in England. On this record we have captured some of their best performances on numbers which they feature regularly in their club appearances. The person responsible for much of the improvisation is Eric Clapton. Two years ago I stuck my neck out to say that Eric would become one of the top blues guitarists in the country. Now I know I was right - he is the best, damn it. A lot of people wondered why Eric left the Yardbirds just as they were hitting big. But Eric had an inevitable course to follow, and at the time it led him to the Bluesbreakers, as no doubt it will lead him elsewhere in the future. Since joining the group, his technique has improved beyond recognition, and on his best nights, Eric can make time stand still. Some idea of this can be gained by listening to his solo on "Have You Heard." But even without stopping the clock his playing can be both breathtakingly beautiful and savage, as on "All Your Love" "Double Crossin' Time" and his two instrumental features, "Hideaway" and "Steppin' Out." As if this wasn't enough, this record marks the first occasion on which the Clapton voice has been aired on disc. (Though he WAS singing “Good Morning Little Schoolgirl" with "Sam"on Five Live Yardbirds - Sneaky Stevie) For his debut, Eric chose the Robert Johnson number "Ramblin' On My Mind", which has a very sympathetic piano backing from John. Because a lot of the spotlight is thrown on Eric, we tend to overlook the fact that John himself is a most capable musician. Besides doing all of the singing (well almost! ), his piano, organ and harmonica playing provide much of the driving force of the group. His flair for composition, with some unusual chord progressions, is also shown to good advantage on "Little Girl" and "Key To Love." The two harmonica features on this record, "Another Man" and "Parchman Farm" usually develop into tours-de-force in a club performance, but here John remains short, sharp, but very much to the point. Trk. 1) Tucked away on the b-side of a 1957 Jody Williams single is a an 8-bar instrumental called “Lucky Lou,” which seems to have been the inspiration behind Otis Rush's last cut for Cobra, “All Your Love.” Both share a distinctive, minor key guitar figure, and alternate between a rumba and a shuffle, all of which has been carried over to the Bluesbreakers' slightly slower version. Mayall's voice, sometimes criticised for being weak or whiny, has a plaintive, yearning tone here which eminently suits the lyric. Clapton double-tracks, one for the riff and another for lead, and though he noodles around a bit aimlessly behind the vocals, he delivers Rush's arpeggiated three-note solo with tremendous vehemence and verve. This recording has made such a mark that even fifty years later it's still a favourite at British Blues Jams, where its changes in rhythmic accentuation confuse novices and veterans alike. Trk. 2) “Hideaway.” Unlike Freddie King's 1961 original, which is uncharacteristically bright and clean, Clapton's version is a lot rougher and dirtier, but his high notes soar beautifully and he manages the tricky double-stopped bit just as well as the master. A verse of Jimmy McCracklin's 'The Walk' replaces the 'Peter Gunn' of Freddie's version and the rest of the band drive along nicely behind the guitar, Mayall himself providing neat keyboard fills. Trk. 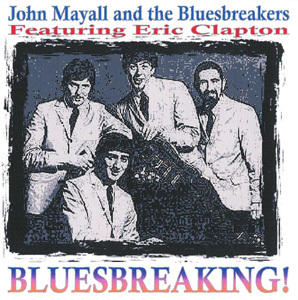 3) “Little Girl.” A lively Mayall original, based on a sequence like Howlin' Wolf's 'Forty-Four', featuring the smoothest, creamiest guitar sound so far, as Clapton alternates between riffing and playing along with the vocal line. He throws in a tasty solo, too, including one bar where the bass and guitar climb up to the next chord in harmony. Overall, very tightly arranged and played, it makes satisfying listening. Trk. 4) “Another Man.” A solo from John and his harmonica in Rice Miller mode, accompanied only by hand-claps and finger clicking. The lyrics are minimal and the tune's really 'Baby Please Don't Go,' but it creates an interesting change in atmosphere from the very electric band material. Trk. 5) “Double Crossing Time” has a rather involved history. Earlier in the year Bassist John McVie had been sacked for excessive drinking, and Jack Bruce, recently ousted from the Graham Bond Organisation, replaced him, giving Clapton his first taste of working with this unusual talent. In March, the band with Bruce and Clapton recorded five tracks for a live album at The Flamingo Club in Wardour Street, but they weren't released at the time. One was included on Mayall's 1969 LP 'Looking Back,' all five surfaced later on Mayall's 1977 'Primal Solos' LP, and they popped up (together with the Immediate sides and some Saturday Club recordings) on the rare 3BR 'Bluesbreaking!' CD. To the joy of the completist, all these and more can now be found on the Deluxe, remastered, double-CD version of 'Bluesbreakers with Eric Clapton,' though the Flamingo tracks may not quite live up to one's expectations. During Bruce's brief tenure, bandleader Manfred Mann, who was well known to Mayall, rang John and enquired innocently after Jack. Shortly thereafter, Bruce left to join The Manfreds, cutting both the chart-topping 'Pretty Flamingo' and the groundbreaking 'Instrumental Asylum' EP, before he quit them to form Cream. However, Mayall was unhappy with what he saw as Mann's betrayal in poaching his bass player, and wrote this song, originally called 'Double Crossing Mann,' intending it for the B-side to the unreleased 'On Top Of The World.' Although here it has a less accusatory title, the song and performance are still pretty powerful, with a pounding piano intro and hurt and heartfelt vocals from Mayall. 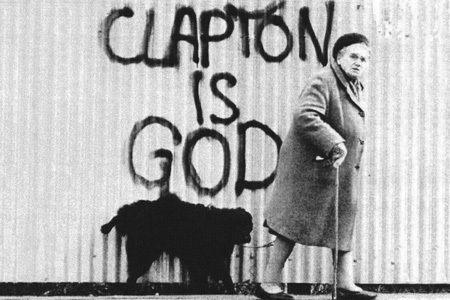 Clapton is again double-tracked, providing a striking cello-like riff which roots the song, as well as an angry, biting solo that skirts the edge of feedback. Take that, Manfred! Trk. 6) Though I hate to take issue with such an authority as Neil Slaven, I have to say that rather than injecting new life into the “cobwebbed” 'What'd I Say,' the group sound as if they're going through this on autopilot. Though no doubt a great success near the end of the night in their live set, Hughie Flint's drum solo doesn't really excite, and Clapton's cheeky inclusion of the 'Daytripper' riff is fun the first time, but doesn't warrant a whole verse to itself. Move along, people, nothing to hear here. Trk. 1) “Key To Love” bursts in with a big, punchy brass riff, courtesy of Messrs. Almond, Skidmore and Healey, and like most of Mayall's originals on this album, it boasts both tight playing, tidy arrangement, and fine production. A very fast shuffle with the words crowded together, it's full of energy, and Clapton contributes a searing guitar solo. Also released as the B-side to the 'Parchman Farm' single, it would have made a fine A-side. Trk. 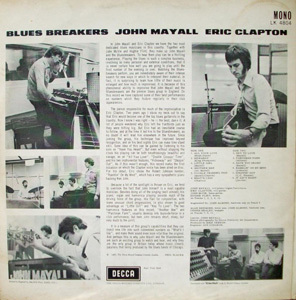 2) Issued as a Decca single under John Mayall's name alone, probably since by its release in September '66, Clapton – not featured - had already quit the band. This is the well-known Mose Allison number performed as a harmonica feature, and supported by bass and drums only, though a little bit of keyboard creeps in towards the end. Well-performed, but an altogether odd choice for inclusion on an album where the guitarist is a selling feature. Perhaps Eric was off changing a string? Trk. 4) In complete contrast, Eric damps it all down here as he sings “Rambling On My Mind” backed only by Mayall's excellent piano. The first sign of Clapton's infatuation with Robert Johnson, this pared-down piece has great atmosphere, beautiful controlled playing, and very nice (if under-mixed) vocals. Simply lovely. The pair repeated their performance as a duo with a single, 'Lonely Years' b/w 'Bernard Jenkins' which made a limited edition release on Mike Vernon's specialist Purdah label in August '66. Trk. 5) “Steppin' Out.” Originally a Memphis Slim instrumental from 1959, where Slim's piano only plays the two chord figure at the beginning and end, the rest being a twelve-bar with solos from sax and guitar. Here, Clapton takes the lead, playing fluently and with fire, generously allowing the boss twelve bars on the organ. The brass section sticks strictly to accentuation, the thing retains its swing, and it rapidly becomes a Clapton Classic. Trk. 6) Little Walter's 1956 Checker single “It Ain't Right” is handled with due consideration, and Eric wisely sticks to background riffing. Mayall's harp takes the lead, though his style is more like Sonny Boy's than Walter's, placing the overall accent on the rhythm. The band breaks with the beat only for the last couple of bars, writing 'finis' to an LP that will go down in Blues history. By the time this album was released, Eric had already left to form Cream – luckily Bruce and Baker decided not to use his suggestion, “Sweet & Sour Rock & Roll,” for the band's name. Originally conceived as some kind of Super Blues Band- half of their debut album 'Fresh Cream' consisted of Blues covers from Muddy Waters, Howlin' Wolf, Robert Johnson and Skip James – they went on to balance their Blues content with original material, benefiting from Bruce's increasing skill as a songwriter. Meanwhile, Mayall replaced Clapton with Peter Green, and went on to record 'A Hard Road,' another Classic Album in its own right. Back here at home, the LP garnered plenty of positive reviews, Melody Maker proclaiming,"No British musicians have ever sounded like this on record. It is a giant step," and Beat Instrumental adroitly pointing out "It's Eric Clapton who steals the limelight, and no doubt several copies of the album will be sold on the strength of his name." The “Beano Album” as it's affectionately known, stayed some 17 weeks on the charts, rising to number 6, and has influenced musicians and fans the world over, ever since. 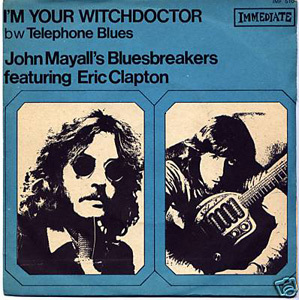 But though Clapton joined John Mayall to play “pure” Blues, the guitar sound and style he developed was so different and innovative that it in some ways betrayed his attempts to stay true to the roots of Blues, instead giving rise to the 'Blues/Rock' genre now played by stars like Joe Bonamassa, Walter Trout, Buddy Whittington, and Kenny Wayne Shepherd. © Stevie King 2015 for the British Blues Archive.